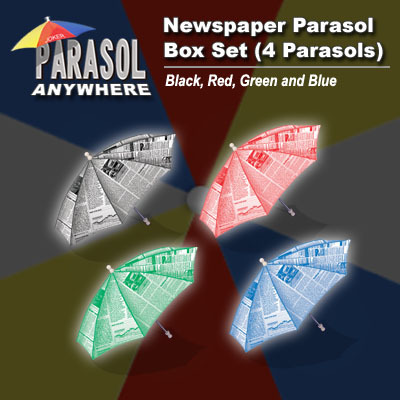 The Newspaper Parasol Box Set contains 4 newspaper pattern parasols. The newspaper parasols are ideal to be produced after any newspaper effect, e.g. Torn & Restored Newspaper, as a climax. Newspaper parasols are elaborately designed and have different colors, they can be easily added to any parasol act and diversify your performance. Simply enter your details below and we will send you an e-mail when “Parasol Box Set (4 Parasols, NEWSPAPER)” is available to ship!